the physiologic death of cells; a normal mechanism in the constant turnover of many cell populations. Called also bionecrosis. adj., adj necrobiot´ic. necrobiosis lipoi´dica a dermatosis characterized by patchy degeneration of the elastic and connective tissue of the skin with degenerated collagen occurring in irregular patches, especially in the dermis, most often on the mid or lower shins; usually associated with diabetes. a condition, in many cases associated with diabetes, in which one or more yellow, atrophic, shiny lesions develop on the legs (typically pretibial); characterized histologically by indistinct areas of necrosis in the cutis. a skin disease characterized by thin, shiny, yellow-to-red plaques on the shins or forearms. Telangiectases and crusting and ulceration of these plaques may occur. Necrobiosis lipoidica is usually associated with diabetes mellitus and occurs most often in women. Treatment includes precise control of the diabetes and, possibly, intralesional application of corticosteroids. 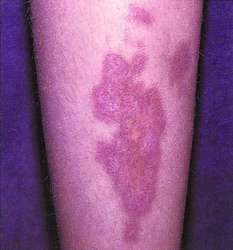 An inflammatory dermatosis that is most common in diabetics (75% of cases), usually on the legs. In 10% of patients, it precedes the onset of diabetes. It is less commonly associated with inflammatory bowel disease, rheumatoid arthritis, and thyroid disease. Dermatology An inflammatory condition seen in 50-80% of DM, most often on the legs; in 10%, NL precedes onset of DM. See Non-insulin-dependent diabetes mellitus. A condition often associated with diabetes, in which one or more yellow, atrophic lesions develop on the legs. Successful treatment of chronic ulcerated necrobiosis lipoidica with 0. Treatment of necrobiosis lipoidica with topical psoralen plus ultraviolet A.
Necrobiosis lipoidica diabeticorum in a juvenile diabetic: treatment by excision and skin grafting. Unsightly rash on shin: what started as a few small red spots was now an 8 x 6 cm well-demarcated red-brown plaque on the patient's shin. Was it linked to her diabetes? Necrobiosis lipoidica classically presents as annular violaceous plaques on the anterior legs, but may appear on the arms, hands, feet, or scalp. Various common and rare skin disorders associated with diabetes include diabetic dermopathy, necrobiosis lipoidica, diabetic bullae, diabetic thick skin, yellow skin, acanthosis nigricans, eruptive xanthomas, disseminated granuloma annulare, scleredema, yellow nails, skin tags, diabetic rubeosis, vitiligo and lichen planus. Other diseases seen with a lesser frequency in the descending order included: acrochordons, diabetic dermopathy, necrobiosis lipoidica, viral infections, pruritus and xanthelasma(Table 1).